Last week was a week which we will never forget when our historic landmark, Norwich City Hall clock, finally got its shine back. For years and years the four faces of the clock have loyally watched over us, but, as with everything in life, the passing decades and the erratic British weather had taken their toll, leaving them dull, corroded and discoloured. All four sets of giant hands, forty-eight batons and the four corner finials at the top of the tower needed to be carefully attended to in order to bring them back to life. The first step was to remove the hands. Once in our workshop they were stripped so that the corrosion could be dealt with and then they were repaired as necessary. Both sides of the hands were primed and painted before the front of the hands were gold leafed in double thickness 24ct gold leaf (a longer lasting, more weather resistant alternative to gold paint). The hour markers on the four dials were not removed but were instead covered and protected whilst the building work to the clock tower was carried out. 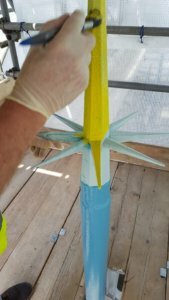 Weeks later following preparation and corrosion treatment of the finials and batons, it was time for the real fun to begin! Thankfully, getting to the top of the tower to prep and leaf the finials was a joy in itself and not the arduous task it might have been if we’d have had to climb stairs. The sun was shining and the exterior lift, which took us slowly up the outside of the scaffolding to the top, gave us an awe inspiring view reaching miles over the city. 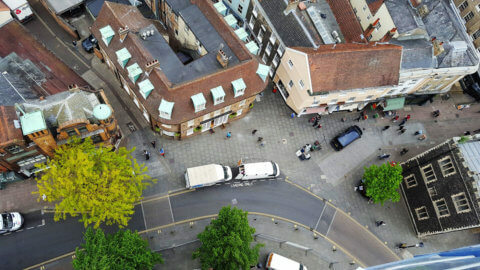 As the distance between us and the hustle and bustle of the busy streets below grew wider we felt a sense of pride in what we had been tasked to do as well as a feeling that we were probably working in the best location in Norwich that day! 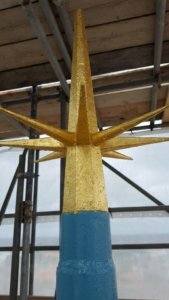 Once at the top, equipped with hard hats, boots, high visibility jackets, paint brushes, paint and books of gold leaf, the hard work began. The first task was to cover all 4 finials in yellow paint. The paint gives a tacky surface for the gold leaf to stick to. Once painted, the 24 carat double thickness transfer gold leaf was then applied by hand, square by square. 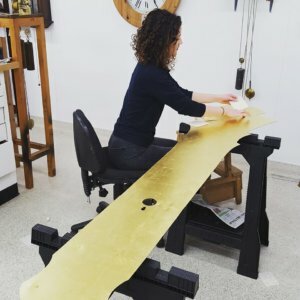 The gold leaf is left looking rough until the next day when it can be gently brushed to remove loose leaf and to finish off the appearance. Over the next few days we again enjoyed the trips up and down the lift whilst admiring the spectacular views. 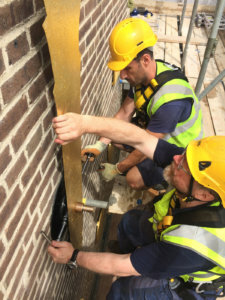 We improved at navigating our way around the scaffolding and up and down the ladders to reach the huge batons which we gold leafed one by one. The polyphonic harmonies and rhythms of busy city life, buskers, dogs barking and traffic were the soundtrack to our days. Apart from one finger numbing cold morning when we had to hold onto the sheets of 24 carat gold with our lives (and our frozen digits) to stop them blowing away in the strong winds, we were blessed with bright sunshine and a warm summer breeze. At the end of day 4 when all four sides were finally completed we were able to stand back (not too far – we didn’t fancy a trip off the edge!) and admire our work. We all felt extremely proud at what we had accomplished. In the following few days, the motion works, which we had previously removed, stripped, cleaned and re-lubricated, were re-installed. Unlike the previous days of easy joy rides in lifts, we had arrived on site to some rather disturbing news. The lifts were out of order…every single one. After the grim realisation had sunk in that we now had our work cut out for us, up the stairs to the clock tower we climbed, motion works in hand. These are by no means light. These are big and heavy pieces of machinery and there are A LOT of steps. With each step our quadriceps were screaming, our heart rates accelerating and the sweat glands were working overtime. Who says clockmakers have an easy life?! Last but not least, the jewel in the crown, the piece de resistance, came the re-installation of the beautifully newly gilded hands. Job done – and a good one at that! Now we can proudly look up at all four dazzling faces watching over our fine city, in all of their yellow gold glory, and say ‘we did that’!